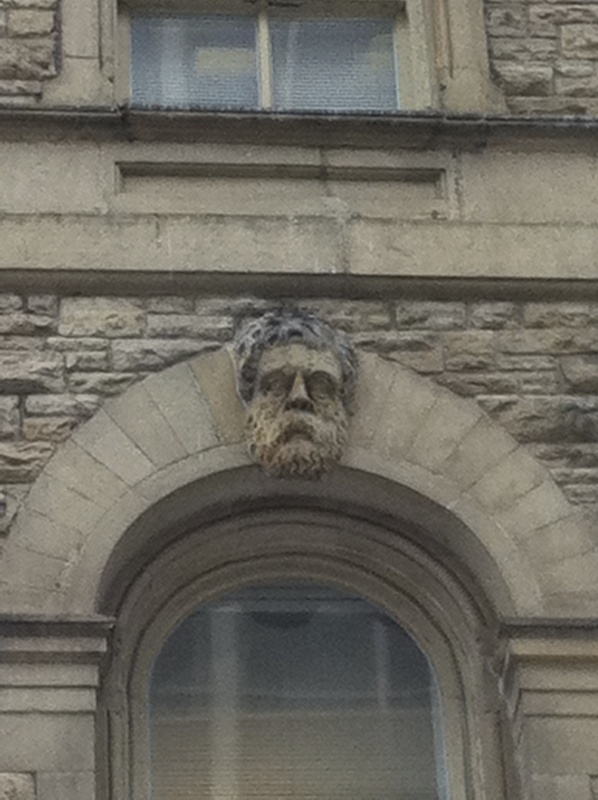 At 93 Sparks St. in Ottawa 11 scowling heads adorn a historic building. However, one of the heads is oddly smiling. Once a bustling avenue of shops, restaurants, hotels and theatres, Sparks Street today is a mere shadow of its former self, a once glorious past swallowed by the Federal Government and the National Capital Commission who expropriated most of the buildings on the downtown Ottawa street. With a good portion of its past life-force depleted, a stroll down Sparks Street can still provide an interesting look back at some of Ottawa’s finest preserved architecture. A look upwards on a walk down this historic street reveals fascinating details that may be overlooked when walking with eyes straight ahead at street level. One such architectural detail up above provides a curious mystery and may reveal Ottawa’s own version of the DaVinci Code. Dubbed “Canada’s Four Corners Building”, the structure has been covered with scaffolding for years. 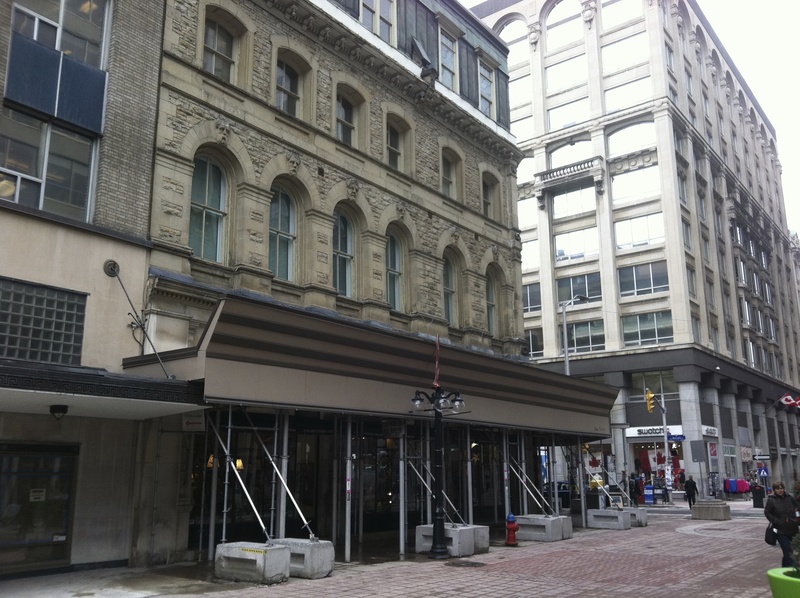 Located at 93 Sparks Street, at the corner of Metcalfe, there is a building dubbed “Canada’s Four Corners”. For as long as I can remember, this building has been the home to the longest operating souvenir shop in Ottawa, its impressive architecture filled with various pieces of Canadiana being offered to the throngs of tourists that pass it each day on their way to Parliament Hill. Also for as long as I can remember, the old building has been unfortunately encased in what seems to be a perpetual scaffolding facade that hides its ground level grandeur. Above the scaffolding there are details of sculpted heads that adorn the keystones of each second level window. These scowling bearded faces all look identical, except for one…one head is mysteriously smiling. Different than the others, this smiling face for some reason is the only head that is not scowling. Why is it smiling? To solve this mystery of expression, let’s go back and check out the history of this old building…. 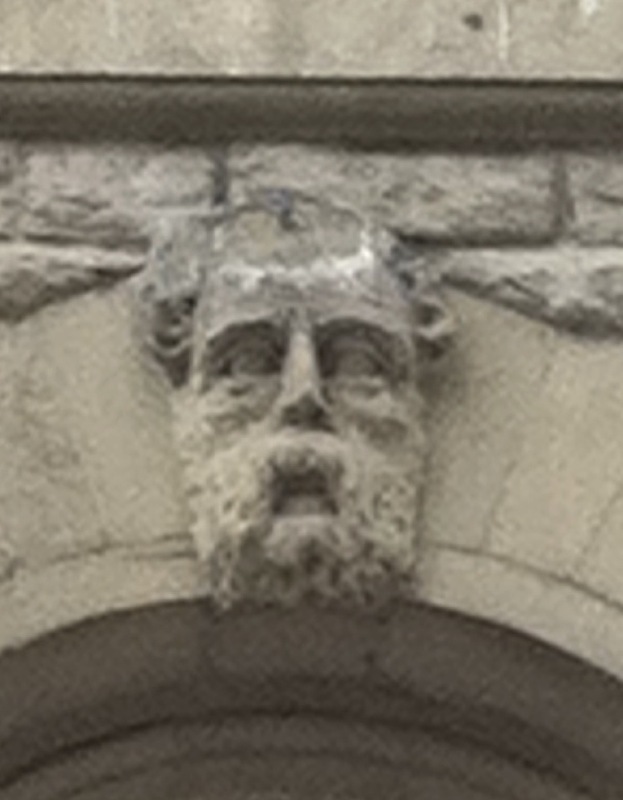 The only one of the eleven carved heads on the building that has a grin. 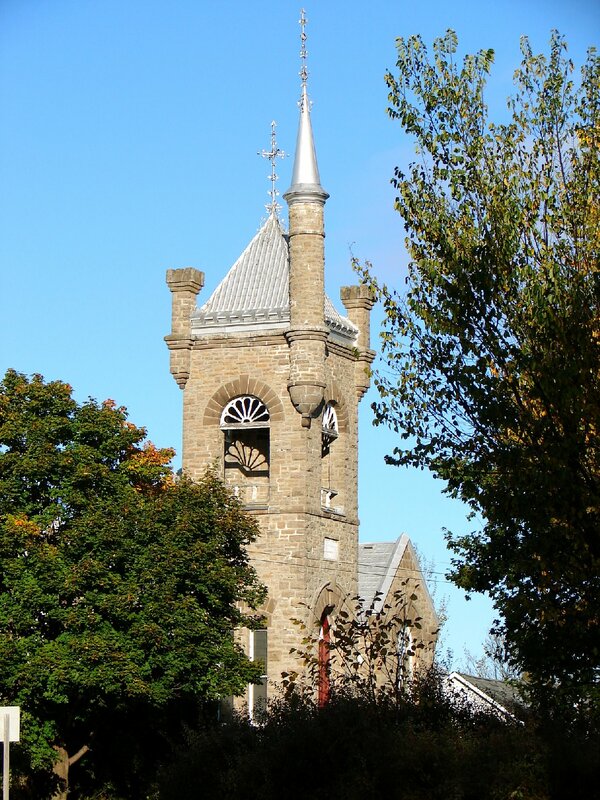 Built in 1870 by John Kelly, the structure was designed by Ottawa architect King Arnoldi, who also designed many churches and other notable buildings throughout the Ottawa Valley. 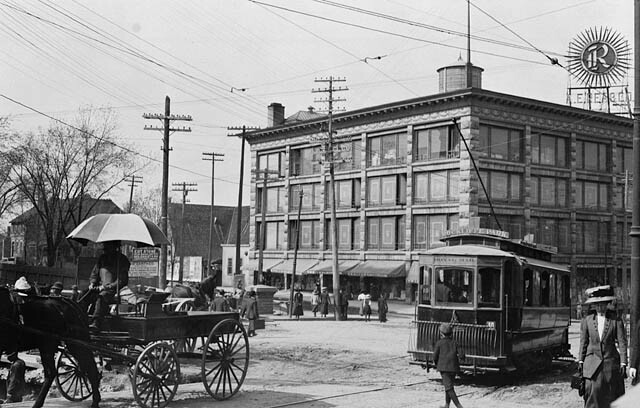 Built as a rental property, it was first called “The Montreal Telegraph Building”, whose first tenant was the Merchant Bank Of Canada, a very influential bank that was part of the financial empire of prominent Montreal entrepreneur, Sir Hugh Allan. 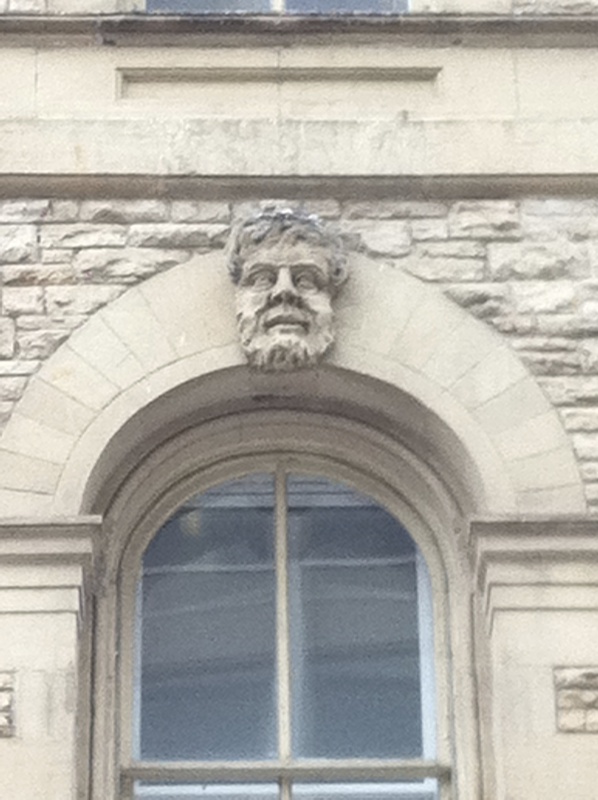 Sir Hugh Allan was the richest man in Canada when he died in 1882, and a study of this man may reveal clues as to why there are bearded sculpted heads on his building. Sir Hugh Allan. Shipping magnate and the richest man in Canada. All ten of the eleven keystone heads are similar in appearance. Hugh Allan was a Scotsman who made his vast fortune as a shipping magnate, owning the largest privately owned shipping empire in the world. Based in Montreal, Allan’s riches grew after he became the director of the Bank Of Montreal while still in his thirties. 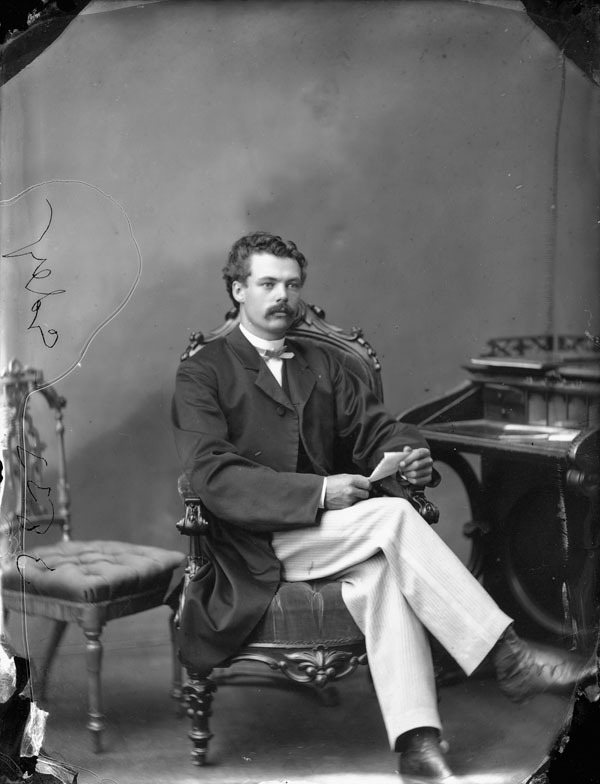 Allan formed the Merchant Bank of Canada in 1864 and because of his association with the bank he garnered further wealth in his other profitable ventures. Allan invested in communications technology, manufacturing, and mining. 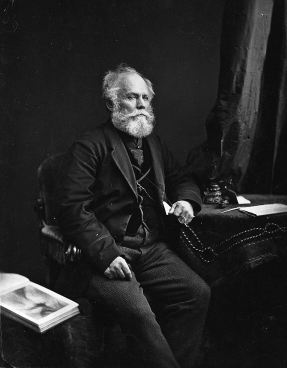 In 1852, he became president of the Montreal Telegraph Company, and rented out the new Sparks Street building to his own bank, the Merchant Bank of Canada that operated in the building until 1954 when it was sold to the Canadian National Railway. Sir Hugh Allan’s castle mansion on Mount Royal filled with mythological symbols. He named “Ravenscrag” after his favourite childhood castle ruins in Scotland. Allan was somewhat of an illustrious fellow infatuated with the realm of fantasy and mythology. As a child, Allan was obsessed with a medieval castle ruin in Scotland near Ayrshire, a castle called “Ravenscraig”, a place where he would spend countless hours exploring. 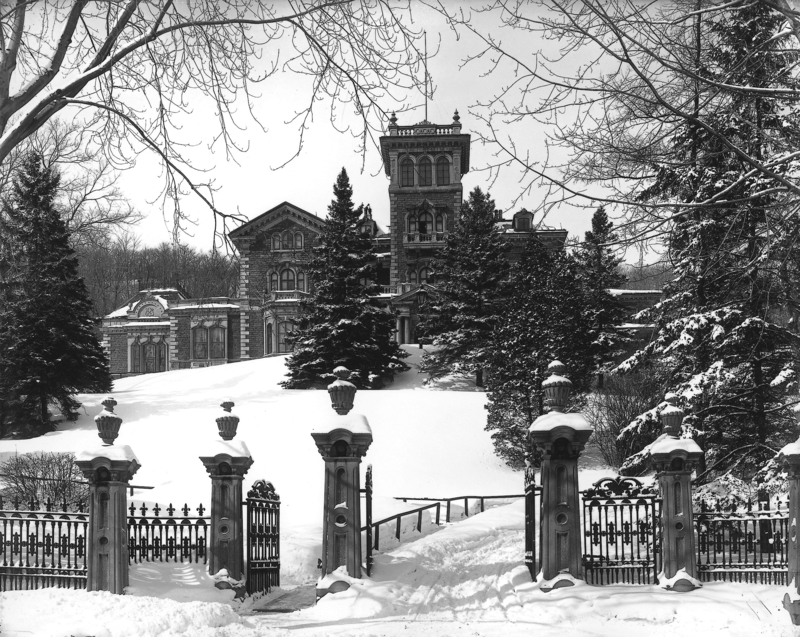 After become extremely wealthy in Canada, Allan bought property in Montreal on Mount Royal to build his own castle, a mansion he dubbed oddly enough “Ravenscrag”. This imposing 72 room property was decorated with figures inspired by Allan’s interest in mythology, including hand-painted frescos and murals illustrated with mythological scenes. His favourite room at Ravenscrag, the library, was dominated by a wall-to-wall mahogany bookcase decorated with carved panels depicting sea monsters and mermaids. 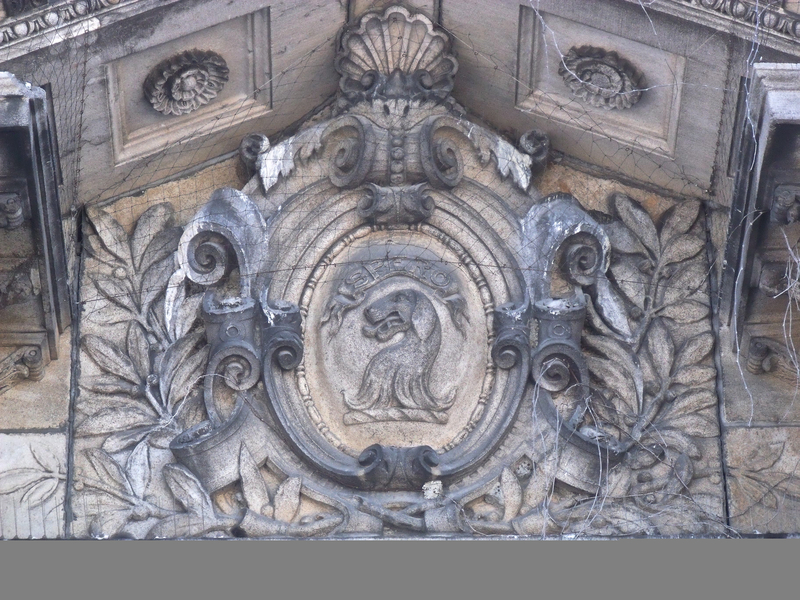 Above the main entrance to Ravenscrag, a sculpted crest with Allan’s motto “SPERO” greets those that enter, which in Latin means “I hope”. Allan’s motto and crest above the main entrance to Ravenscrag. One can speculate that Allan had a hand in the design of the Ottawa Sparks street building in collaboration with King Arnoldi. Arnoldi’s experience with medieval church design combined with Allan’s fascination with mythology may be the reason the building is adorned with 11 sculpted heads. But who are these heads representing and why is only one smiling? The heads are the keystones in each of the arched windows of the building. Ten of them are of a scowling bearded man that look remarkably similar to Sir Hugh Allan himself. Perhaps Allan wanted to ensconce his likeness into his building like the Greek gods he was fascinated with in ancient temples of past. Yet one of these carved heads has a completely different expression. The smiling head is perhaps a clue Allan left for us to figure out, an unsolved mystery that was part of a bigger puzzle Allan arranged with Arnoldi. A look back at Allan’s life history reveals he had 11 children. There are 11 carved heads. One of his children, Arthur Allan, was the last child to be born in 1871, in the exact same year the building was being built. Arthur later died in a fire. Is the smiling head a representation of Allan’s last born child, a symbol of hope for his empircal dynasty like his motto ‘Spero” implied? Also in the year 1871, Allan was created a Knight Commander of the Order of St Michael and St George by Queen Victoria for his services in connection with the development of ocean steam navigation in Canada. Perhaps his knighthood in the same year the building was constructed could be a clue to the grinning carved head. Allan died in 1882 and took with him the secret of the smile. Wanting to solve this Ottawa DaVinci Code, I asked staff who currently work in the building if they knew why one of the heads is smiling but they hadn’t even noticed the anomaly. The architect of the building, King Arnoldi died in 1904, so we may never know what the two men were up to when they designed these heads. 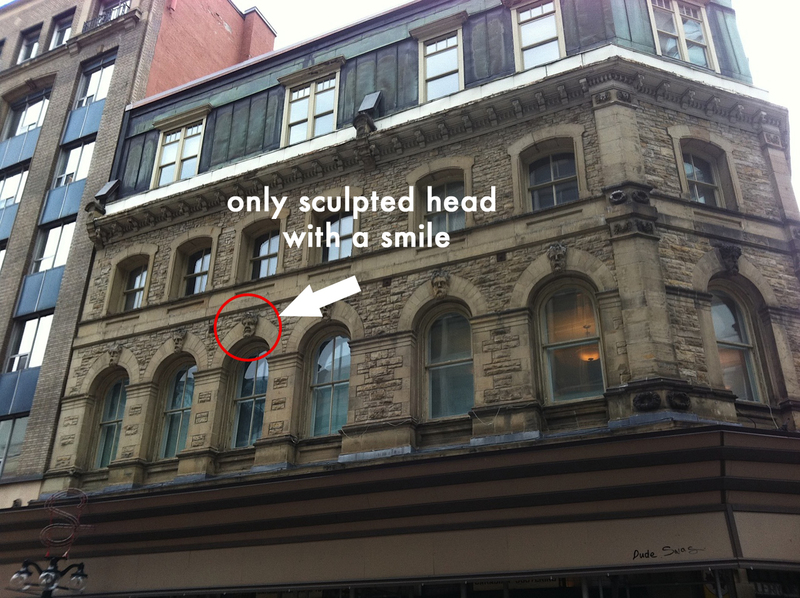 Until someone else comes forward with an answer to this mystery, the carved face on Allan’s grand building will continue to smile down on the Sparks Street souls that unknowingly pass below. 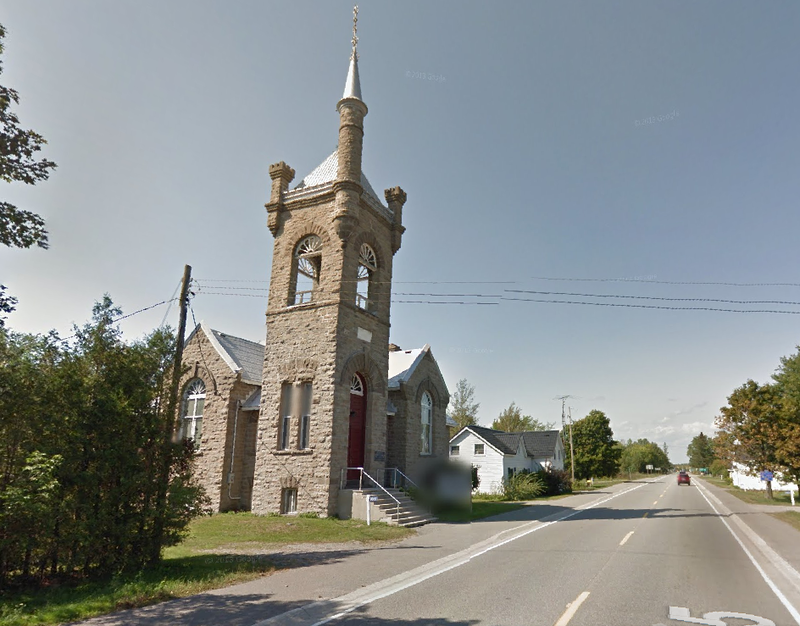 For as long as I’ve been driving back and forth to Ottawa along Highway 15 the familiar sight of a stone spire in Franktown, Ontario has signalled my journey to the Nation’s Capital was almost at an end. The landmark stone spire and conical tin roof that looks like it was grafted on to the side of the building from the Disneyland castle has always meant I had about 35 minutes left of driving before I arrived home. As a kid in the back seat of my parents car, I’d always eagerly look out for the “castle” in Franktown….and now, the century old building designed by a notable Ottawa architect is up for sale. The Franktown Castle is actually St. Paul’s church, built in 1901, opened in 1903 and was designed by none other than the famous Ottawa architect Moses Chamberlain Edey . 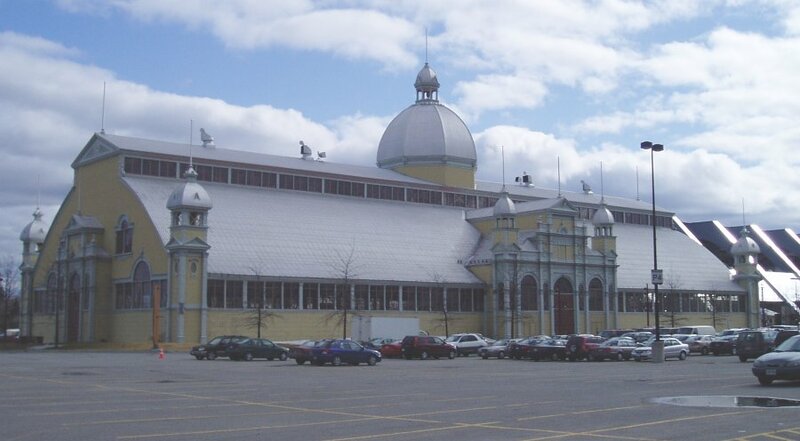 Edey also designed the Aberdeen Pavilion at Lansdowne Park, a National Historic Site and the infamous downtown Daly Building, which was Ottawa’s first department store. The construction firm who built it was ‘James Wilson’ of Perth, ON for a cost of $6100. The church stone came from the J. McEwen Quarry, in Beckwith Township and was blasted out with dynamite and drawn in the raw state by the men of the congregation using horses and wagons or sleighs. The stone was dressed on site with all the materials, sand and stone, donated to the Church. 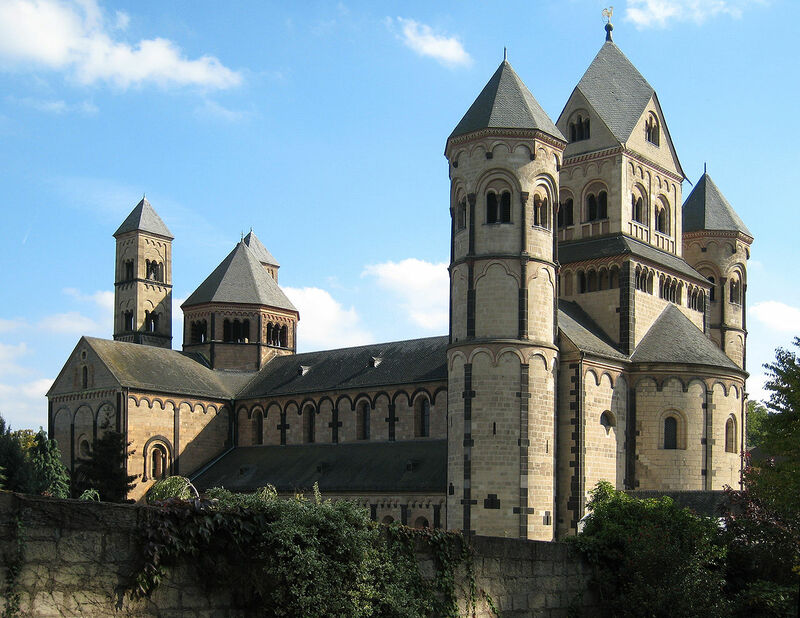 Built in a Romanesque architectural style of medieval Europe which is characterized by semi-circular arches, towers and spires, the revival of the Romanesque style was carried through Edey’s church design for Franktown. The Romanesque Revival style was widely used for churches, and St. Paul’s is no exception with its Norman castle like corbelled corner turrets and spire, complete with a conical peak. Edey Romanesque style contrasts his other work in Ottawa, which was the Aberdeen Pavillion at Lawnsdowne Park, and the Daly Building which was built in the “Chicago” style, both designs that came after his work designing the church in Franktown. 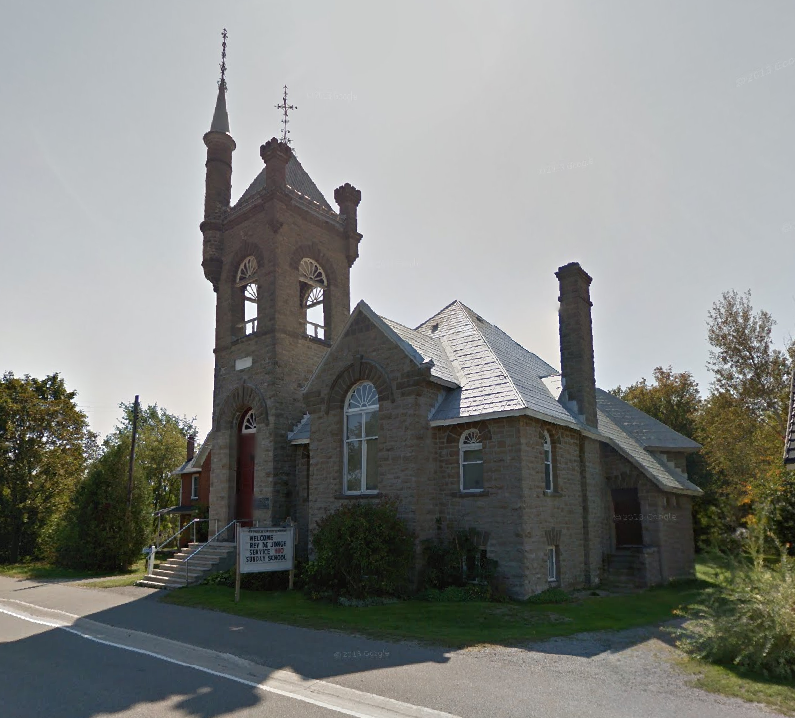 After more than a century in operation, the church congregation decided to sell the historic building in September 2014, and it it is now listed with Re/Max Realty and offered at a reduced price of $199,000. The listing can be seen here. The structure is zoned institutional, which means if you want to purchase it and convert it into your own personal castle, you would have to apply for rezoning it as residential. The church space features a large open main floor and in the church basement there is a full kitchen so you could host your very own church bake sales. 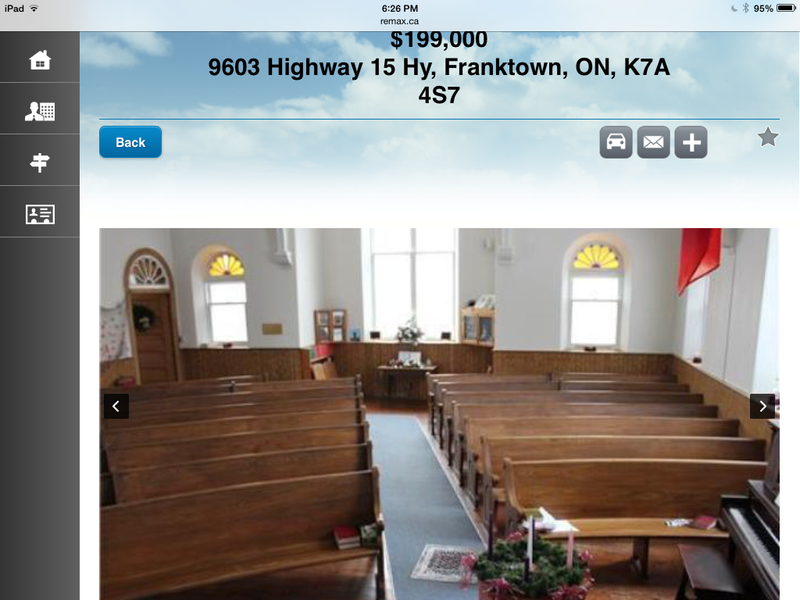 A photo from the Re/Max realty site that is selling the church. A full church basement kitchen is perfect for bake sales. 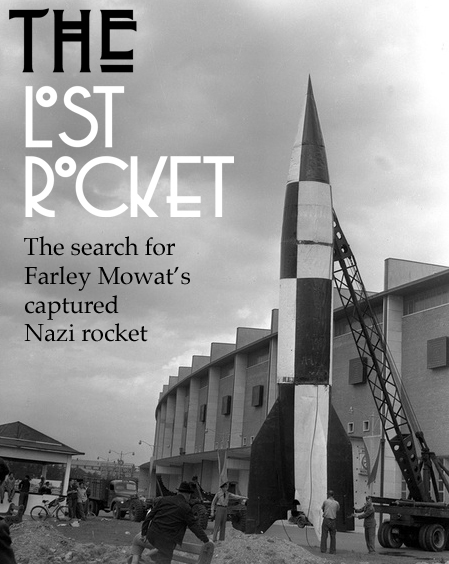 Canada’s lost V2 rocket story begins during the closing months of WW2 when a Canadian Army captain began to collect captured and abandoned German equipment to send back to Canada for analysis and museum display. The Captain in charge of this 1st Canadian Army Museum Collection Team was none other than famous Canadian author Farley Mowat. 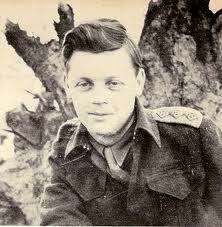 Captain Farley Mowat during WW2. Farley Mowat in his book “My Father’s Son” outlines how Captain Mowat quickly assembled an impressive collection of German, tanks, vehicles and assorted equipment that can be seen today at the Canadian War in Ottawa. 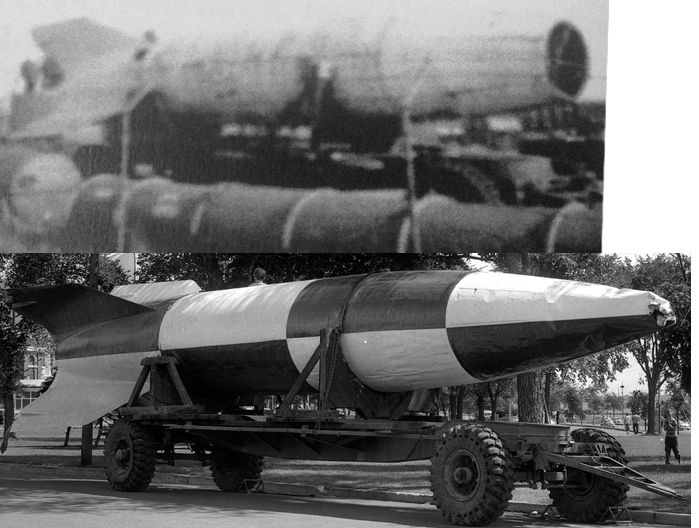 One such piece of captured German technology that was collected by Captain Mowat was an advanced 12 ton liquid fueled rocket, the V2, or (“Vengeance Weapon 2”), technical name Aggregat-4 (A4). It was the world’s first long-range ballistic missile, and the precursor to all modern rockets, including those used by the US and the Soviet space programs. 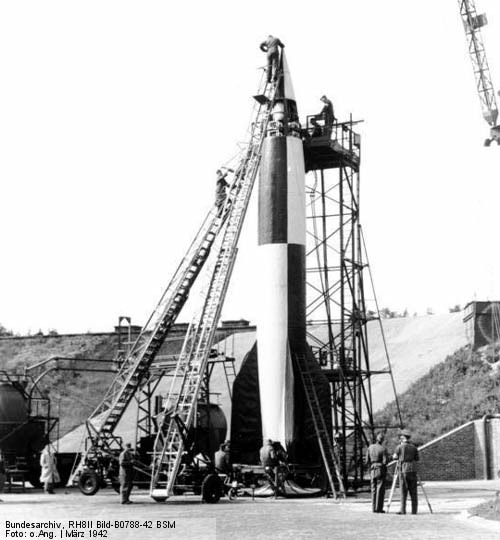 A German V-2 being tested at Werner Von Braun’s advanced rocket test facility at Peenemunde in Germany. 6,000 of these advanced rockets were built by German forces with half being fired onto Allied targets during the latter part of World War 2. Designed by Wernher von Braun, who was later an integral part of the American NASA rocket program and the NASA moon missions, this 50 foot tall rocket was the most advanced weapon of its day that paved the way for rocket and space exploration after the war. The very first photo from space was taken from a captured V2 rocket in 1946 launched by US scientists. At the end of the war, a race began between the United States and the USSR to retrieve as many V-2 rockets and their support staff as possible. Three hundred rail-car loads of V-2s and parts were captured and shipped to the United States and 126 of the principal designers, including Wernher von Braun and Walter Dornberger, were in American hands. Von Braun, his brother Magnus, and seven others decided to surrender to the United States military to ensure they were not captured by the advancing Soviets or shot dead by the Nazis to prevent their capture. 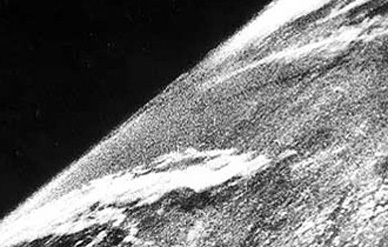 The very first image taken from space was from a captured V-2 rocket in 1946. Due to the advanced technology of the V2 and its desirability by US, Russian and British research scientists, Captain Mowat was forbidden to take his captured V2 rocket back to Canada. This did not stop the determined Mowat who knew this was a valuable prize for Canada, and took the necessary action to get the rocket back to Canada. With British guards protecting the rocket which was now on a train, Mowat and his team apparently got the guards drunk, then loaded the rocket off the side of the train and onto a trailer. They then transported the rocket to Holland to a waiting Canadian cargo ship bound for Montreal. 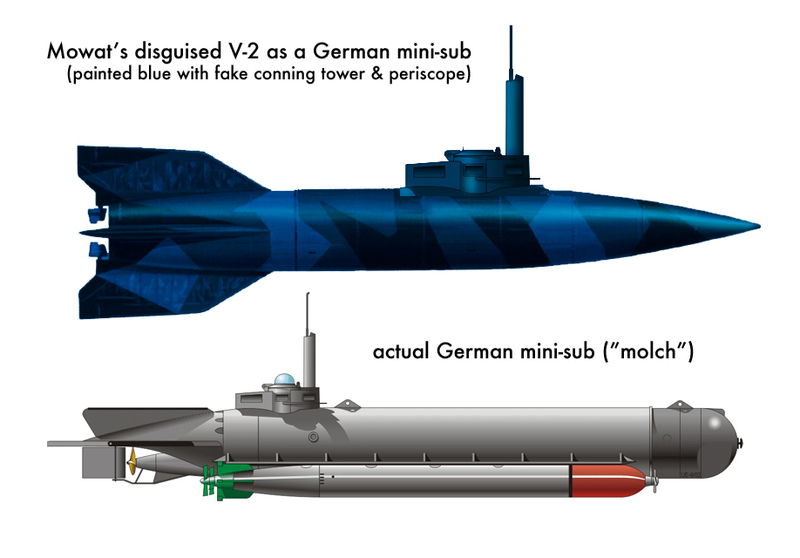 With Americans that would surely confiscate the rocket, Captain Farley and his team disguised it as a German submarine, painting the rocket blue and adding a fake periscope. Mowat disguised the captured V-2 as a German mini-sub in order to smuggle it past American guards to get it back to Canada. It was loaded without incident aboard the Canadian cargo ship and safely made it’s way back to Canada where it was unloaded in Montreal, dismantled, studied and blueprinted at the Canadian Armament Research & Development Establishment (CARDE) in Valcartier, Quebec. After being scrutinized by CARDE, the Department of Defence loaned the captured V2 to the CNE in Toronto to display at the 1950 CNE. Re-painted in its German test pattern paint scheme at CFB Centralia, it was transported to Toronto where the CNE placed it upright on display for the many visitors see at the 1950 CNE. After that, the history of Canada’s V2 rocket falls into relative obscurity. 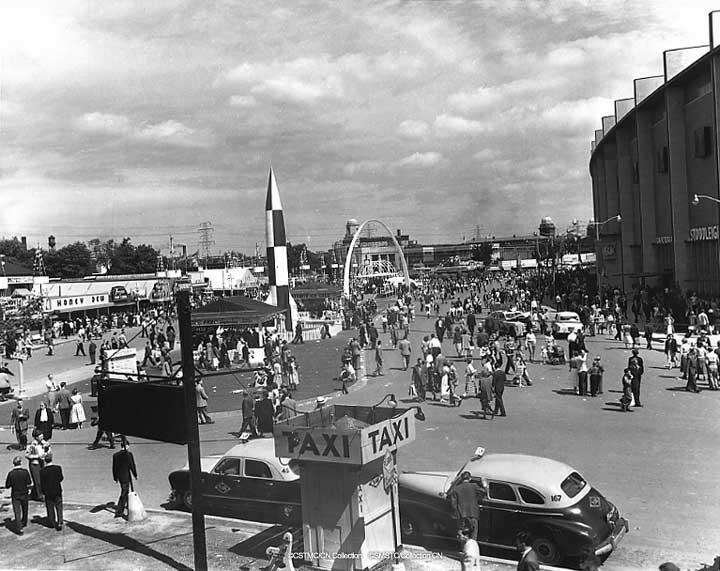 The captured V-2 rocket as seen on display at the 1950 CNE in Toronto. 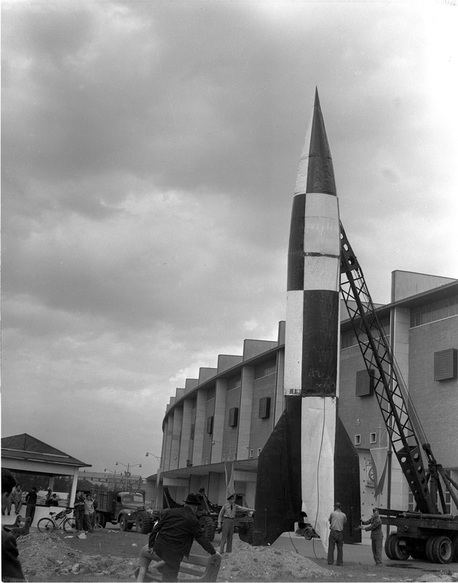 Department of Defence crew preparing to display the V-2 rocket at the 1950 CNE in Toronto. 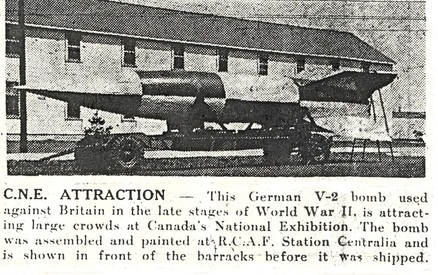 A newspaper clipping showing the V-2 after being studied by CARDE between 1945-50 and re-painted to be shipped to Toronto for display at the 1950 CNE. With its nose cone damaged (from a truck backing into the hitch it seems) the V-2 after its display at the CNE. Where it went after the CNE remains a mystery. A retired Air Canada pilot, David Savage, who lived in Picton, Ontario during the 1960s may be able to provide some possible clues as to the final resting place of the lost V2 rocket. Picton, a small town in Prince Edward County, three hours from Ottawa, once had a massive airport full of hangers, buildings, barracks and other assorted military establishments from its WW2 role of training RCAF pilots and crew. In the 1960s, the base was still operating, but was then used for storing surplus aircraft and artillery training. Surplus P-51 Mustangs, B-25 Mitchell bombers and other assorted aircraft were stowed away to be sold off for scrap or to private collectors. In his recent book “Camp Picton”, local author Ian Robertson mentions the V2 rocket in great detail. I contacted Mr. Robertson who graciously offered his time to tell me about the V-2 that apparently ended up in Picton, Ontario in 1961. A photo that appears in Robertson’s book taken by Mr. Savage as a teenager in 1961 clearly shows what appears to be the lost V2 rocket sitting on its side, apparently on the same trailer used to transport it around at the CNE, weathered and missing its crumpled nose cone. The unmistakable shape and size is clearly that of a V2 rocket. 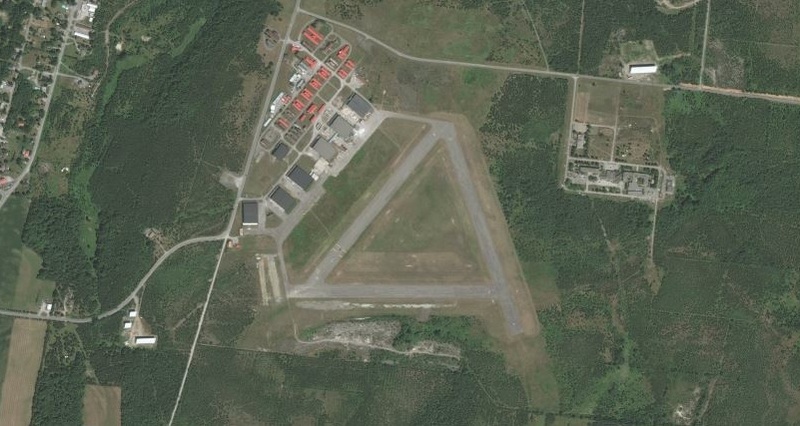 It seems logical that it was brought to the Picton airbase for storage with all the other unwanted old DND equipment. Savage left Picton in 1962, never knowing what happened to the V2 he captured on film. The base closed in 1969, and the the whereabouts of the V2 closed with it. No further information about what happened to the stored rocket can be found. Comparing the 1961 Picton photo with the 1950 CNE photo provides a definite match, even when the two photos are superimposed on top of one another. An exact match. Super-imposing the 1961 photo by Savage over the 1950 CNE photo of the V-2 provides an exact match. Locals in Picton who also grew up during the 1960s recall the V2 and other unwanted old equipment being bulldozed into the base landfill site. If this is the case, a very significant piece of world history lies under the surface in Prince Edward County waiting to be discovered, preserved and exhibited in a Canadian museum along with the fascinating story of how it got there. Having grown up in the area myself, and flying out of this airport many times with my dad who kept his plane here, I can attest to the fact there are many wartime artifacts strewn around the area. Aerial view of Camp Picton as it looks today, and the last possible resting place of the V2 rocket. The airport landfill site lies south of the current runway. Loch-Sloy currently owns the airport property. The landfill area at Camp Picton as it looks today. The lost V-2 rocket could very well lie below its surface. The airport property, including the landfill area, is currently owned by Loch-Sloy Holdings Ltd. who have reported that the landfill area is a “contaminated” zone and further investigation or digging would be hindered by this designation. Does Canada’s lost V2 rocket sit buried underneath a layer of dirt in Picton? With only 20 remaining in the entire world out of the original 6,000 made, it would certainly be a worthwhile endeavour to excavate the area and find out once and for all if indeed our captured German WW2 rocket truly remains lost.